There are so many great arenas around Sydney to enjoy a day of laser tag skirmish. Don't be fooled, laser tag isn't just for kids. Many laser tag arenas, offer packages not just for birthday parties, but hens/bucks nights, even functions and corporate events. Laser tag skirmishes usually run for about 15 minutes of battle, but you can play as many games as you like. Laser tag can either be played as a team sport or everyone for themselves. The great thing about laser tag, is that it really teaches you about working together as a team - while having a lot of fun. While laser tag is quite a vigorous workout, most arenas do not encourage running - due to dimmed lights, strobe lights and doors opening and closing on timers. So, physical fitness while a benefit, is not a must have to enjoy a game of laser tag. There is also, no bruises the next day from being hit with something physical - it's just a laser. The price for casual play and party packages is generally around the same amount at each laser tag arena. For one game per person it ranges from $12 - $15 with most battles running for 15 minutes. Party packages include 2 battles of laser skirmish, food, arcade tokens, gift for the birthday boy or girl and party bags, ranging from $24.90 to $42, usually requiring a minimum of at least 8 guests. Of course, you can also book group packages for casual play to bring down the price per person of a laser skirmish. 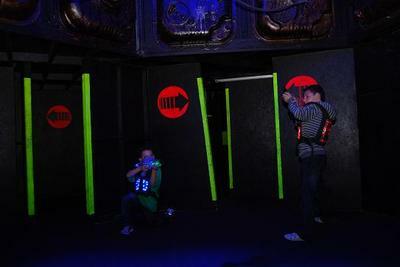 Laser tag really is a great acitivity for the weekend, whether as a family or going out with friends. It's perfect for winter time as it's all indoors and with arenas being fully air conditioned you can expect the greatest comfort while you battle. Laser tag is one of the best interactive game experiences - the ultimate sc-fi battle. When: Any day of the week. Hi Christine, Just noticed your article on Laser Tag in Sydney. Last year I started a business called Aim4Fun Mobile Laser Tag. Now you can have all the Laser Tag FUN brought to your own home. No need to organise all the players to go to an indoor centre, now you can play in your own backyard where you can avoid all the extra costs of food and drinks that you are charged at these venues. And if you don't have enough room at your place, we can organise to play in a local park! If you have a party like this, your child, or partner will be very popular for a long time! Just go to www.aim4fun.com.au and check out all the fun, or visit us on Facebook at Aim4Fun. Thanks! We have also started a mobile laser tag business servicing primarily the Sydney North Shore. The games are played in the outdoors, and the kids can run around - unlike at more indoor venues. Parks with lots of trees are the best places for a birthday party. Its best to bring along plenty of drinks as the kids get really thirsty!